For some people the idea of going to an event or gathering unaccompanied, whether by a date or a friend, is upsetting. They become anxious with the thought of having to go somewhere alone, and often rather embarrassed by it as well. 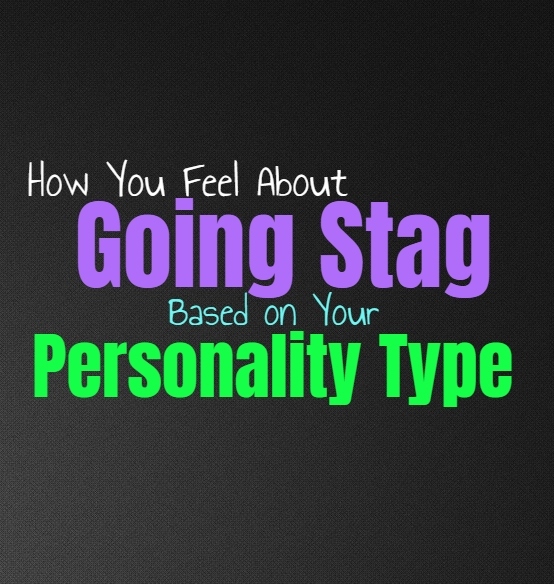 Here is how each personality type most likely feels about going stag. INFJs really don’t mind going stag or going places alone, this can actually be rather enjoyable for them. When they go somewhere by themselves it takes a lot of pressure off of them to perform or behave a certain way. INFJs sometimes enjoy just having this time to themselves, doing the things they like without having to interact with those around them. Just being around people without having to directly deal with them, can be something that brings the INFJ a sense of comfort. Feeling a sense of distance while still being around people, is less likely to drain the INFJ. So for them going stag isn’t always a bad thing and can actually be enjoyable. ENFJs can feel a bit embarrassed if they have to go stag, especially if they are in a situation where they feel they should go accompanied. ENFJs are friendly people who enjoy being around others, and so being lonely isn’t something they want to get used to. They can certainly handle going stag to certain things where they have an opportunity to meet new people and make connections. When it comes to things like going out to eat or going to events, ENFJs really do prefer to have someone with them. INFPs are introverts and so they often enjoy having time to themselves without feeling drained by the presence of others. They don’t need to be around others or go accompanied by someone to feel comfortable or enjoy themselves. INFPs only feel uneasy about this when it seems like others are pressuring them to find a date or friend to attend with. Most of the time INFPs enjoy being on their own, especially when they feel like they need to recharge and just have distance. ENFPs do enjoy being around others, but going stag isn’t always the worst thing for them. They also like being able to make new friends and connections, and so they are willing to step into these situations. They take going stag to things as a chance to get to know someone new, and experience something without feeling obligated to the person they are with. While ENFPs don’t like going to everything alone, there are times when it can be enjoyable for them. INTJs really don’t mind going stag to things, instead they enjoy being on their own most of the time. For the INTJ it can be rewarding to attend things without someone by their side, since they often feel drained by too much social interaction. Being able to go to an event or gathering by themselves, gives the INTJ the room to get away and not be around people once they become a bit exhausted. They often enjoy going out to eat or watching movies on their own, since they have the time to think and do what they please. ENTJs do often prefer to have someone by their side when it comes to most events or gatherings. They are outgoing people who can often make new friends and connections, but that doesn’t mean they enjoy attending on their own. ENTJs do want to have people they can feel connected to though and having the option of going with someone at their side is often more rewarding than needing to attention something stag. INTPs really don’t mind going stag to most things, since they do enjoy this time to themselves. If they feel like they are being judged or watched it can change their feelings in these situations though. They don’t like feeling as if they are being judged for their choice of going somewhere alone, and want to feel free to do this without being invaded. INTPs do however enjoy going stag sometimes, because they enjoy this time alone. ENTPs don’t mind going to certain things stag, since they can often make new friends and connections this way. While they do enjoy having things they can experience on their own sometimes, not always needing to have a partner at their side. On the other hand there are times when the ENTP wants to have a friend or date with them, so that they have someone to bounce ideas and creativity off of. ENTPs just want to be open to new things instead of feeling locked into one option. ISTJs don’t mind attending certain things alone, since they do enjoy having the time to themselves. While there are times they have to go it alone, ISTJs do enjoy being able to have this time in peace and quiet. They become drained by constant interaction and so having someone with them at all times really isn’t necessary. If there are events where it seems wrong to go alone, the ISTJ will want to find someone to go with to keep them company and make them not feel embarrassed by the situation. ESTJs don’t really like the idea of going to things stag, especially if it will cause people to judge them. ESTJs don’t want to be put into this situations if others will see them wrong because of it. ESTJs are also outgoing people who prefer to be able to connect with others and make a sense of community, ESTJs often prefer to interact with people and attending events stag can make them feel like they are going to be misunderstood. ISFJs don’t like going to things stag because it can make them feel like they have failed in some ways. They prefer to have a friend or partner by their side to make the situation much less uncomfortable. ISFJs care about how others perceive them and don’t like stepping into these situations alone. While they do enjoy time alone to themselves, when it comes to attending things stag they can certainly be bothered by this. ESFJs don’t mind going to certain things stag, but ultimately they want to know that they have friends they can meet up with. For the ESFJ it isn’t about attending the event or gathering alone, it is about feeling lonely or awkward throughout the experience. If they know they won’t be judged for going alone, then they might actually enjoy the sense of freedom and space it provides for them. ISTPs don’t mind going stag, since they can often make friends and meet new people easily. They enjoy being able to feel a sense of freedom in their choices and actions. For the ISTP stepping into something new without having to have someone with them, is often more freeing and enjoyable for them. They don’t want to feel controlled by others or obligated to them and their actions. ESTPs don’t really like going stag to most events, but for the most part they are willing to do so. ESTPs are outgoing and charming people who do enjoy making new friends and meeting new people. For them going to things like events, movies and dinners alone can feel awkward and uncomfortable. ESTPs prefer to have someone to share these things with or else they become bored and maybe a little anxious. ISFPs don’t really mind going to most things stag, since they don’t dislike being alone. For them being around people for too long can be draining, unless it is someone special who does not exhaust them. ISFPs don’t mind going to some things stag, while there might be specific events which mean a lot to them. When the ISFP has something which is truly important, they often want a loved ones by their side. ESFPs don’t really like going stag but that doesn’t mean they are incapable of it. They often prefer to have someone by their side keeping them company and making the experience more exciting and fun. ESFPs usually want to find someone to attend these events with them, and don’t really like feeling forced to go alone. While they don’t like it, that doesn’t mean ESFPs aren’t brave enough to go stag and still have a great time.